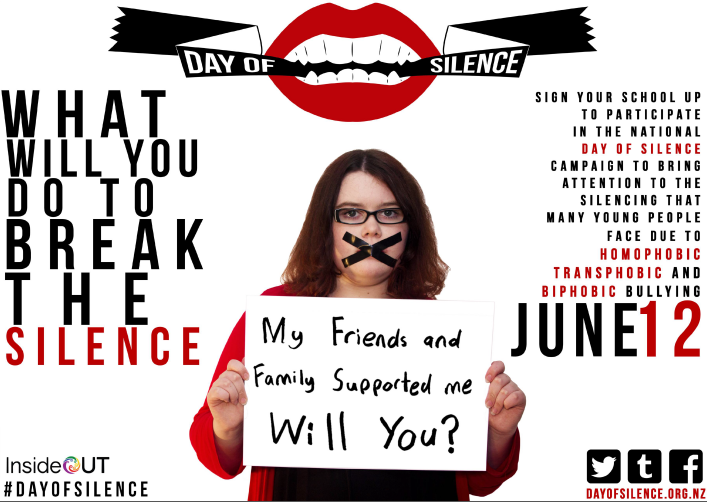 This Friday, the 12th June, Newlands College will for the first time take part in the Day of Silence. The National Day of Silence is a day of action in which students across New Zealand vow to take a form of silence to call attention to the silencing effect of homophobic, biphobic and transphobic bullying, name-calling and harassment in schools. If you chose to participate you will take a vow of silence in an effort to encourage classmates to address the problem of bullying and discrimination towards others based on their sexual orientation or gender identity or expression by illustrating the silencing effect of bullying and harassment on queer and trans students and those perceived to be queer or trans. Homosexual, bi, trans, queer people are part of our community and at Newlands College we celebrate that diversity; we do not marginalise it. It is OK to be who you are. Homophobic, transphobic and biphobic bullying takes place when someone is targeted because of their actual or perceived sexual orientation or gender identity, or that of someone within their family or friend group. As with all types of bullying, it can involve name-calling, derogatory comments, spreading of rumours, isolation, and even physical abuse. Phrases like “that’s so gay”, all-too-often dropped into casual conversation, can also be seen as bullying, because many people feel they are slurs against members of the gay, transgender, or bisexual communities. Often it is just the joke comments that can hurt the most. We believe it is important to recognise that bullying affects all sorts of people differently – and it is not OK to be silent on this issue. The Day of Silence is an example of students working together proactively to bring attention to name-calling, bullying and harassment experienced by queer, trans and straight students alike. The Day of Silenceis a human rights campaign that you can all can get involved in. Being part of the day doesn’t excuse you from participating in lessons however, nor does it impact your ability to use your voice to save the person who is about to get hit by a bus. You’ll still need to speak if your learning requires you to. One way of participating is by putting tape across your face to show your support for the cause or you can wear a Day of Silence sticker, or hold on to a day of silence card. Tape, stickers and cards will all be available from the Dean’s Room this week. The other simple way of participating is writing Day of Silence on your hand, and showing it to anyone that speaks to you. NZ has been participating in the Day of Silence since 2007, and this year there are over 40 New Zealand schools registered to take part. This includes Wellington Girls College where 520 students have signed up to participate. Being involved and taking a vow of silence for part or all of the day is a way of showing that homophobic, transphobic or biphobic bullying is not OK.
Newlands College supports diversity within the student body. We stand here today proudly representing people from the queer community. If you are someone who identifies as lesbian, gay, bisexual, trans or anything on the diverse sexuality spectrum, then support is here. A support group in the College continues to run with students that have already identified that they are lesbian, gay, bisexual, transgender, or something else on the rainbow. If you want to find out more about this group, approach Mr Cargill, Ms Farrant, Mr Pegram, Mr Milmine, or make an appointment with Ms Montgomery the guidance counselor. The group does runs confidentially and it is appreciated that the school community respects this. Bullying is an issue faced by the rainbow community, and the day of silence is a way of acknowledging the marginalisation that this group can experience. Homophobic, transphobic and biphobic bullying is not OK. However, it is OK to be who you are and to be proud of that. It is also right to be accepting of others and everything that makes each of us unique. Celebrate the diversity of our school, our society and stand up for accepting one another for who we are. More relevant videos can be found on the InsideOUT YouTube page. You might also be interested in the Day of Silence Facebook event, or InsideOUT’s website. This entry was posted in Events and tagged Biphobia, Bullying, Day of Silence, Homophobia, InsideOUT, Transphobia. Bookmark the permalink.